Just had phone call to say another hog is coming to me tonight, she says he/she is quite small but eating. I will go and pick the hog up after the lady finishes work. She wanted to keep the hog herself and try to rear it, but then I told her what was needed to rear a young hog at this time of year, she decided to let me have it. Looking forward to hearing more about this latest one, fingers crossed it does well. Well I have been out and bought a new box, got everything ready, might get to use my new heat pad out. She got my phone no. from the BHPS makes a change from the vets. dread to think how many i would have if i was getting calls from them!! can't wait to meet/see/hear about the new one. Good luck with this one Ron, sounds like you are doing a great job! Have been to pick him/her up, at least this one is nice and round, having a rest at the moment will have a closer look later. Did manage to weigh, and weighed in at 299g. As got a few all white spines on her/him, hope its female. White spines indicate that the Hedgehog is young. That would explain the weight. Hope he/she does well for you. Good luck and all the best with this new Hedgehog. Good luck Ron. I hope the Hedgehog does well. Well this one is causing a little concern, as lost 20g since last night, wont eat anything, I have just managed to get a few syringes of cat food/weetabix soup down her neck, as soon as you put it in her mouth gulps it down as fast as she can. Only problem is the white nasty smelly gunge coming out the other end. I have just given her some baytril, this could be a long night. hopefully shes just settling in and will pick up soon. Might be an idea too, it won't hurt as a precautionary measure, will do good if worms are present. It is an idea to worm all new Hedgehogs you get first thing. And also any other treatments, because, as you all know, things spread. 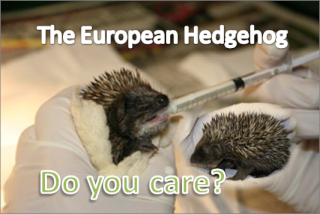 The last thing you want is other Hedgehogs catching it that you have already treated. I section mine off from any other Hedgehogs when I first get one, and then let them in together when they have been treated. You are doing a very good job Ron, Hedgehogs do lose a bit of weight here and there. And if she likes being hand fed then at least she is eating. Good luck with the Hedgehog, I hope it puts back on the weight soon. She had a few syringes of water/sugar mix last at 12.30 before bed, got up at 6 and she was still with us, gave another 4 syringes of mixture as soon as you touch her gums and teeth she knows what to do. At 9 I gave her 4 syringes of chicken flavoured baby food mixed with water and she gulped that down with another drop of baytril. Will try and find bigger syringe so I can feed more of a paste rather then a soup mixture. Luckly I am at home fot the next few days so will be feeding every couple of hours. at least shes eating even if it is from a syringe, must of been a relief this morning, i know i always dread checking them. sounds like you've got a busy few days. Been to vets today to get a few things to make life easier, got a rew more syringes, some Hills a/d to make into soup for her feed, some pro biotic powder because of her upset tummy and some Effydral which they say is the same as lectade - Rehydration fluid and I did'nt have to get my wallet out, I did'nt have the cheek to say double the order.